ROH brought the 8th incarnation of All Star Extravaganza to Lowell, Massachusetts as The Motor City Machine Guns, The Young Bucks and The Addiction went did battle over the World Tag Team Championships in a Ladder War and CMLL World Lightweight Champion Dragon Lee made his ROH debut opposite old rival Kamaitachi. With IWGP Tag Team Champions The Briscoes, IWGP Intercontinental Champion Tetsuya Naito, ROH World Champion Adam Cole, Colt Cabana and KUSHIDA also in major places on the card, this was going to be fantastic, right? The main event was arguably the best Ladder War that ROH has ever presented as Nick and Matt Jackson, The Young Bucks recaptured the World Tag Team Championships in a stuntacular bout with The Motor City Machine Guns (Alex Shelley & Chris Sabin) and The Addiction (Christopher Daniels & Frankie Kazarian). From start to finish all six guys worked their collective arses off, keeping things ridiculously pacy and marvellously silly throughout. Like imagine what these three teams could do in a normal six man tag and then throw all the madness of Ladders and Tables and Chairs and barricades and what have you and then like double your expectations and then some more expectations on top. That's what these three teams some how managed to produce. I sat and watched with my mouth open for pretty much the entire 25 minutes. Moves off the top of the Ladder, a superb sequence with four daft bumps coming within the space of a bout twenty seconds, Superkicks, Daniels' face becoming the proverbial crimson mask, Superkicks, Kaimtachi and Jay White getting involved, superkicks, superkicks, two ridiculous Indy Takers, more daft bumps onto ladders and guard rails and a couple more superkicks. That list barely covers it to be quite honest, it doesn't even cover the amount of superkicks. Superkicks. ROH has produced some marvellous Ladder War in the past, with Steenerico's clash with The Briscoes in 2007 and Kevin Steen and El Generico's 2012 epic both springing immediately to mind, but this may have been the best of bunch, especially in terms of sheer mental spots per second. However, this wasn't just the best Ladder War in ROH history, this was arguably the best match that ROH has produced in the last seven or eight years. Outside the main event, the biggest match on the card was the debut of CMLL World Lightweight Champion Dragon Lee as he collided with old rival Kamaitachi for a brilliant semi-main that wowed the Lowell crowd. This was a completely different contest to everything else on the show as Lee and Kamaitachi went straight at each other from the opening bell, running through a lightning quick sequence before Lee would pull out a tasty suicide dive. It was clear that this was two guys who were very familar with each other as they appeared to be hand picking their best spots, almost as a sampler of what the pair could do in there. The action was mostly smooth, although with any match that decides to go at such a pace for almost twenty minutes there were a couple of botches, including an awkward Standing Spanish Fly spot, that held this one back from being as good as it could have been. The last stretch of the match may have gotten a little bit too silly, as Lee and Kamaitachi seemed to want to cram all of their false finish ideas into the bout, which included Lee kicking out of two Candian Destroyers. The two reversals of Lee's Phoenix Plex looked incredible, but I feel like one would have been enough as Lee's second kick out made it a little difficult to suspend my disbelief, instead of the intended purprose of making Lee look good. However, the actual finish where Lee finally hit the Phoenix Plex, after catching Kamaitachi with a series of knees after rallying from a Death Valley Driver into the corner, was a lot more satisfying because of the previous attempts, even if the move was a bit scrappier than it could have been! This was easily the best match outside the main event and I'm pretty sure we'll be seeing a lot more of Dragon Lee in ROH heading into next year as their relationship with CMLL develops. The tournament for the new World Six Man Tag Team Championship began as ACH, Jay White and KUSHIDA went over The Briscoes and Toru Yano in a Quarter Final bout, that was a lot of fun, but probably went a little too long. Things played out quite nicely from the beginning with the more experienced Briscoes & Yano trio controlling the pace after an early flurry and plenty of cheeky antics from Yano, whilst hot tags from ACH and KUSHIDA provided the bulk of the excitement. The finish was a great moment as KUSHIDA dove off the top rope to take out the Briscoes on the floor, before ACH hit a 450 splash to pin Yano in the ring, that swerved the crowd and got a nice pop. 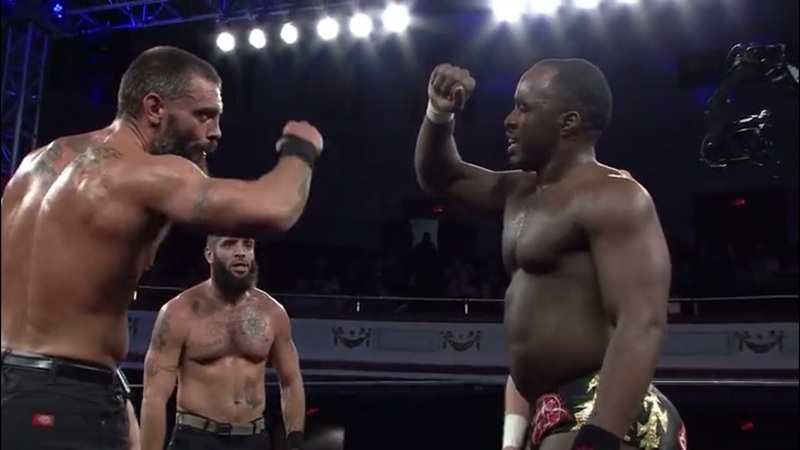 I feel like they could have potentially shaved a couple of minutes of it and improved the bout, but this was still a decent start to what could prove an interesting concept for ROH. The thrown together team of ACH, White and KUSHIDA are yet to come completely together, but they've got enough talent to wing it for the time being. The first match between Michael Elgin and Adam Cole, since Elgin took Cole's World title from him in June 2014, saw Big Mike once again chasing the prize around Cole's waist. For me, whilst being a fairly good match, this match was definitely missing something and didn't really live up to expectations. It seemed to end up as a mish mash of ideas, that involved Cole working the leg, which Elgin sold fairly well when called upon, to build towards a Figure Four, but also the injury didn't get woven into the match as it could have been with Elgin perfectly capable to hit all his usual offence and on occassion seemed to forget to sell the injury entirely. The injury did play into the finish as Cole would deliver a kick to the injured knee before hitting a couple of shining wizards and about the twentieth Last Shot of the match for the win. This was a good match, that got somewhat lost in the mix on the card and definitely struggled to find it's identity on the show. In another case of a match not living up to my expectations, Tetsuya Naito and Jay Lethal had a grudge bout that didn't come close to what the pair could do together inside the ring. There was nothing particularly wrong with this match, but there wasn't anything that wowed me on the level that I know Naito and Lethal could do. Lethal appeared to hit his big moves quite early on, and after the Lethal Combination and Hail to the King had been hit, the contest sort of devolved into various Lethal Injection attempts being thwarted and Lethal having to fight of both Naito and his second EVIL on the outside. 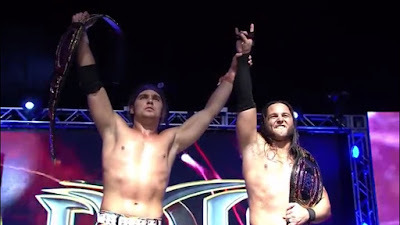 It was a big victory for The Greatest First Generation Wrestling, after many have claimed that the ROH relationship with NJPW hasn't benefitted their performers enough, but it would have felt even more important if the pair had put on a higher quality encounter. Perhaps, with the EVIL interference ROH and perhaps also NJPW are building to a bigger rematch over the IWGP Intercontinental belt and didn't want to give away too much, but again that match will probably take place on an NJPW show, so ROH won't even get the best out of it! The majority of this was another easy watch, but lacked the fire or gear change that would have made it memorable. Dononvan Dijak getting a World Television title shot in his hometown presented an mildly interesting story for his bout with Bobby Fish. The Lowell crowd cheering for the usually heel Dijak gave the match an interesting dynamic, whilst the main story of the bout was a better put together version of the World title match as Fish zeroed in on Dijak's leg and went to work. All though Dijak's selling was a little too much, too soon, leaving him little space to go, the injured knee did produce some strong moments, including a great near fall as Dijak hit Feast Your Eyes, a move that sees him drive his knee into his opponent's face, then couldn't make it to the cover quick enough because of using the bad knee. This was perhaps the wrong choice as the opener as the hometown hero passing out in a rear naked choke isn't the best way to get the crowd hyped for the rest of the show and was also like most of the show overcrowded with ideas. 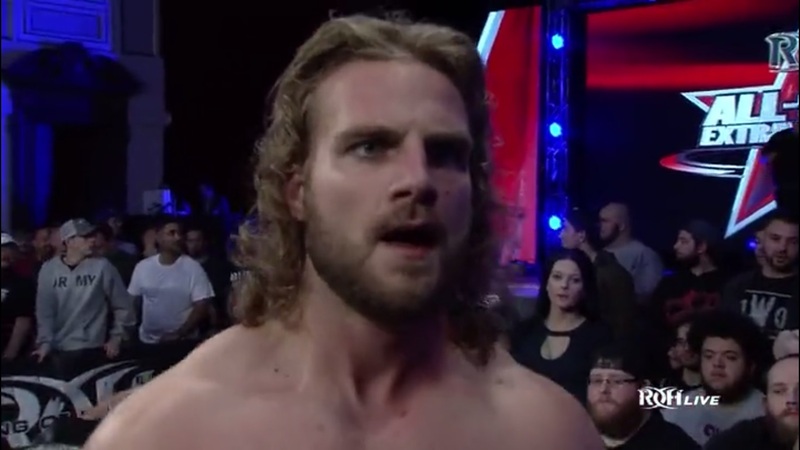 The weakest bout on the card was a heatless encounter between Hangman Page and Kyle O'Reilly, that didn't show any real spark until the post-match angle. The highlight was a clever spot on the apron that saw O'Reilly rebuff a number of hard strikes from Page, only for Page to remove O'Reilly's mouth guard before hammering in the face again! It was a shame then however that Page went for a shooting star press off the apron, that felt completely jarring for the style of the match and Page's heel character and seemed to have been thrown into the contest just because. The lack of audience attention hurt this one a lot as Lowell was pretty much silent throughout, showing very little affection or distaste for either competitor. The finish saw Page tapping quickly to an armbar, before attacking O'Reilly with a chair post-match, with the commentators putting this over as Page attempting to help Bullet Club stablemate Adam Cole by removing one of the contenders for his World Title. One of the best undercard matches was a Four Way Tag for a shot at the Tag Team Championships were Colt Cabana & Dalton Castle would overcome The All Night Express (Kenny King & Rhett Titus), Shane Taylor & Keith Lee and War Machine (Hanson & Rowe) in a fun scramble style contest. The contest was well structured with War Machine and Taylor & Lee keeping most of their focus on each other as their feud continues, including a nice moment where the other two teams would start arguing inside the ring, so War Machine hopped off the apron to fight Taylor & Lee on the other side of the ring. The final stretch saw Taylor & Lee impress with a series of power moves, before the action spilled to the outside as Lee hit a ridiculous dive for a man of almost 300lbs and Hanson replied with a similar jump to the floor. This was a much better candidate for the opener, as it featured a lot of exciting action over a short period of time and also had a feel good moment when Castle pinned Titus following Bangarang to give his team the win. Cabana and Castle as #1 Contender's might seem an odd decision, but with War Machine and Taylor and Lee still feuding and The Cabinet looking to be a big part of the Six Man Title tournament this makes a lot of sense at this point in time. Also when you consider that they'll get to face The Young Bucks it gets a little more interesting. This show was carried by the amazing main event and perhaps also the Dragon Lee v Kamaitachi match, because everything outside of those two matches was average to good, but none of it looked to stand out. The show get's a close to very good rating on the strength of those two matches, with the Ladder War especially being must-see viewing for any wrestling fan. The event lived up to it's billing as there was a cavalade of stars across the event, but a lot of those bonafide stars (Naito, Cole, Elgin, Lethal etc.) seemed happy to coast by on their star power alone. This could have been a must-see show from top to bottom as the card was particularly strong, but in fact if you skipped to the main event you really wouldn't have missed anything in terms of top quality action or storyline advancement. 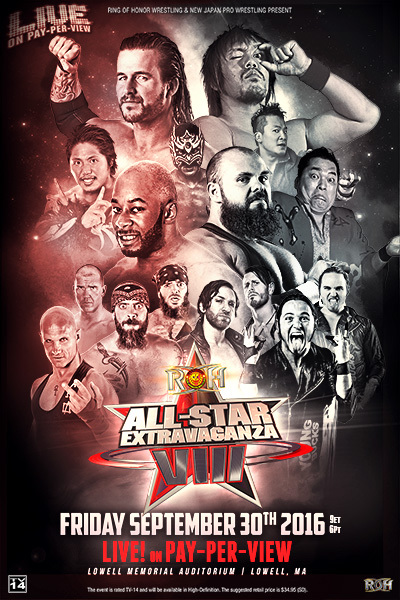 With ROH only producing six PPVs a year, these are the event when the top stars should be looking to really make a name for themselves and help the company grow and whilst the likes of The Young Bucks, The Addiction and The Motor City Machine Guns were putting on a classic, it seems like too many of ROH's top stars aren't grasping at these opportunities with as much vigour as they used to. All Star Extravaganza was a good show, that should have been a great show. All images our property of their respective owners.